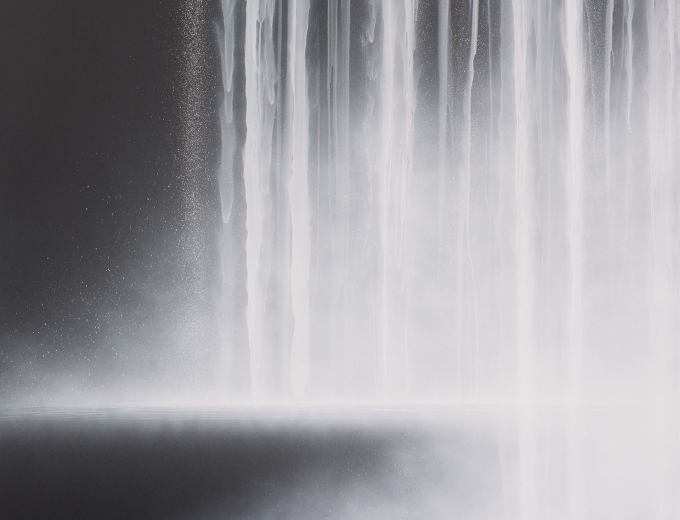 Internationally renowned Japanese painter Hiroshi Senju presents new fluorescent waterfall paintings in the solo exhibition Day Falls/Night Falls at Sundaram Tagore Singapore. 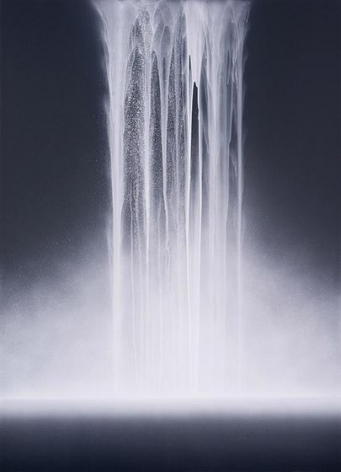 Noted worldwide for his sublime waterfall and cliff images, which are often monumental in scale, Hiroshi Senju combines a minimalist visual language rooted in Abstract Expressionism with ancient painting techniques unique to Japan. 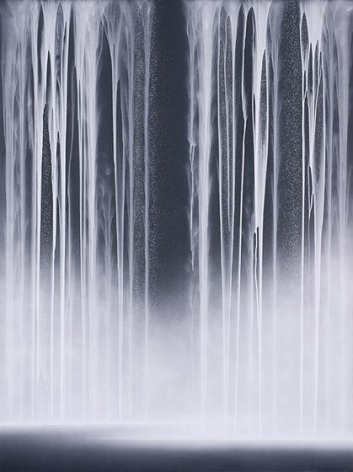 Widely recognized as one of the few contemporary masters of the thousand-year-old Nihonga style of painting, Mr. Senju began exploring the waterfall image in the early 1990s. He seamlessly combines traditional Japanese techniques and materials such as pigments made from minerals, ground stone, shell and corals suspended in animal-hide glue with a modernist visual vocabulary. With incredible delicacy, he pours translucent paint onto mulberry paper mounted on board, creating the sensation of unrestrained movement. 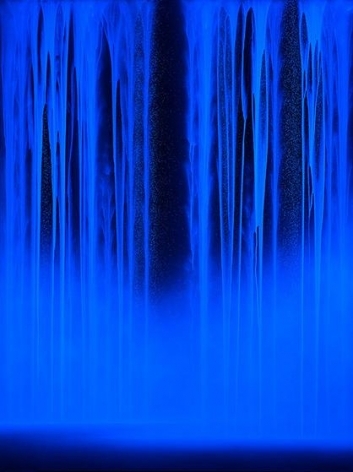 Evoking a deep sense of calm, his waterfalls conjure the appearance, sound, smell and feel of rushing water. For this exhibition, the New York-based artist uses fluorescent pigments, a medium he first explored in 2007. These images appear black and white in daylight but fluoresce an arresting electric blue under ultraviolet light. An ode to the ubiquitous city lights of contemporary existence, Senju’s waterfalls hover between day and night as he straddles the realms of industry and nature, the material and the ethereal. The central portion of the gallery will be retrofitted so the paintings may be experienced under ultraviolet conditions. Here the viewer will be surrounded by two immense waterfall byobu (multi-panel folding screens) that each measure more than eleven-meters wide when fully extended. These painted panels allow the viewer to be completely enveloped in towering, vibrant-blue cascades. Hiroshi Senju was the first Asian artist to receive an Honorable Mention Award at the 46th Venice Biennale (1995) and has participated in exhibitions around the world, including the Beauty Project at the Museum of Contemporary Art, London in 1996; The New Way of Tea, curated by Alexandra Munroe, at the Japan Society and the Asia Society in New York in 2002; and Paintings on Fusuma, at the Tokyo National Museum in 2003. In 2003, Mr. Senju completed seventy-seven murals at Jukoin, a sub-temple of Daitokuji, a prominent Zen Buddhist temple in Japan. In 2004, he was the art director for the new Haneda Airport International Passenger Terminal in Tokyo, where he completed one of his largest installations. The Benesse Art Site of Naoshima Island, designed by Tadao Ando, also houses two large-scale installations. 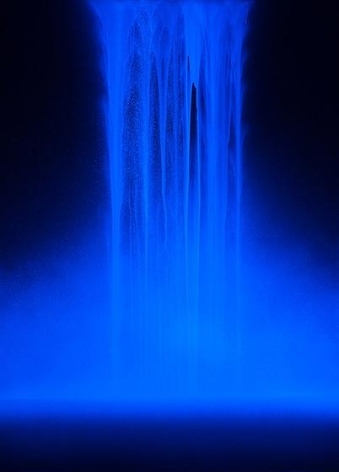 Hiroshi Senju’s work is in the Museum of Contemporary Art in Los Angeles; The Museum of Modern Art, Toyama, Japan; the Yamatane Museum of Art and Tokyo University of the Arts, Tokyo; and the Kushiro Art Museum, Hokkaido, Japan. The Hiroshi Senju Museum Karuizawa, designed by Ryue Nishizawa, opened in October 2011 in Japan. In Singapore, Mr. Senju has completed notable large-scale public works at the OUB Centre and Tower 2 of One Raffles Place. The opening week of Day Falls/Night Falls coincides with Singapore Art Week and Art Stage Singapore. 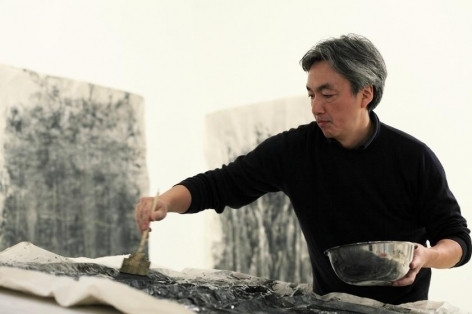 Hiroshi Senju will speak about his art practice at Art Stage on Friday, January 23, from 12:30 to 1:30 pm. The talk is open to the pubic; no RSVP or ticket is required. For more information about the exhibition or the artist talk at Art Stage Singapore, please email singapore@sundaramtagore.com or call +65 6694 3378.